If you already have a flatbed truck or trailer in your fleet and would like to have a multi-reel capacity unit for payout operations — the answer is Hogg and Davis, Inc. SRS8000 reel stand. Also available without swivel base; the RS8000. 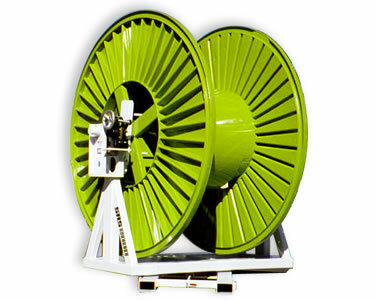 The SRS8000 is mounted on a turntable bearing base with locked position every 3 1/2 degrees. This allows the SRS8000 to be positioned at the right pay-out angle without having to move the truck or trailer. When not in use, the SRS8000 can be easily removed from the bed to free the vehicle for other tasks. These reel stands can be loaded with different size cables and left at the job site. After the job is done, the cable reels can be left on the stands and stored in the yard until the next cable pay-out operation. 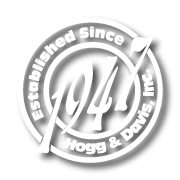 Like all other Hogg & Davis products for the line construction industry this comes with the reputation for reliability and rugged dependability. For a low initial investment, the SRS8000 or RS8000 reel stand is your alternative to a dedicated multi-reel capacity dolly. Weight capacity: 8,000 lbs. (3,628 kg), Reel capacities: Up to 96” dia x 68” width, Baked acrylic urethane finish PPG2185 White, Dimensions: 96” (2438mm) wide x 36” (864mm) deep x 66” (167mm) high, RS8000 weight 1,500 lbs. approx. Anti-overspin 16” diameter bronze disc brake and Hydraulic retriever. Weight: SRS8000: 2,000 lbs. approx.